Our small classes offer tuition to suit the beginner, improver and those with more experience. Our project-based workshops and courses cover dressmaking, home projects, accessories and seasonal crafts whilst our technical workshops concentrate on particular skill areas such as zips, seams or pockets. We limit most of our workshops to just four participants (three for dressmaking) so you get individual attention and support. We welcome adults of 18 and over, and young people aged 12 and over accompanied by an adult. Sorry, no under 12’s yet, but we're working on it. All materials and equipment are provided except where stated (usually the only thing you need to bring is your own fabric). Gütermann off-white or black thread is provided, with alternative colours available to purchase. When bringing your own fabric for dressmaking, please wash it before the workshop (this ensures there will be no shrinkage after you have made your garment). Fabric choice - many of our customers already have a favourite fabric so bring their own to the workshops. For craft and home projects, we do have an increasing range of fabrics on sale here in the shop though, so unless you are particularly trying to match something we may well have something to suit. Our gift vouchers can be used to pay in full or part for any of our workshops. We use Silver sewing machines. These are lovely machines - ideal for beginners but with plenty of additional stitches to suit experienced dressmakers. You are welcome to bring your own sewing machine. Please let us know if you decide to do this, and remember to bring the manual too! 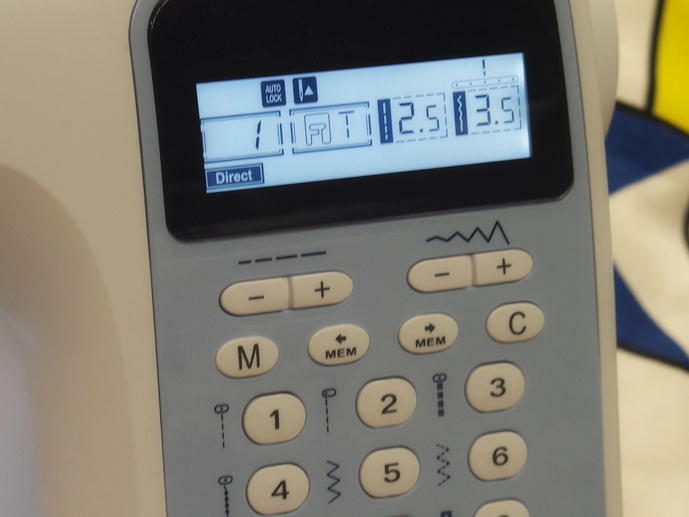 If you haven't used it much we recommend you come on one of our "Get to know your sewing machine" sessions to make sure you're comfortable with it first. If you can’t see what you're looking for in our programme, or maybe not at a time when you can make it, please let us know so we can arrange something that suits you. We are quite happy to put on a workshop for just one person, but for special occasions groups up to six can be catered for, so these workshops are also ideal for things like baby showers, hen parties or a works do with a difference. We can also accommodate you in our "Sew by the hour" sessions if you just want to use our space and sewing machine for your own projects (subject to availability). The choice of fabric is a personal one - something to match or compliment your home decor perhaps, or a particular favourite for a dress or top. That's why we ask you to bring your own fabric with you for most of our workshops. We do have a growing selection of fabrics for sale in the shop as well. Your choice of fabric also depends on your experience. If you are new to sewing it is best to start with a fabric with structure; cotton, polycotton, poplin, linen, corduroy, needlecord or chintz. Confident sewists might prefer to bring along more challenging fabrics like satin, crepe, georgette, chiffon, taffeta or velvet. All our projects and workshops use woven fabric. Please do not bring any knitted fabrics - jersey, fleece, interlock or rib knit for example - unless you are doing a workshop or course that specifically requires stretch fabric. If in doubt, just ask. Finally, it is really important for most of the dressmaking sessions that you wash, dry and iron your fabric before the workshop. If your fabric is going to shrink, let's make sure it happens before you make your garment, not afterwards. This is less important for things like the pull-on skirt but even then, if you have the time, it's a good habit to get into. Introductory level. No experience necessary. New to machine sewing or brushing up on old skills. Beginner level. Simple projects suitable for all levels of machine experience. More advanced. Confident in sewing techniques and machining. 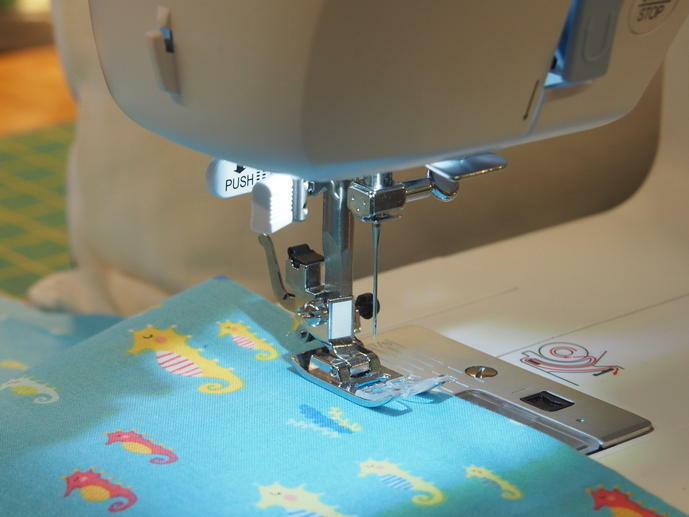 This workshop is suitable for a beginner to machine sewing. Learn the basics of a sewing machine and make an envelope cushion. We cover measuring, buttonholes, plain seams and finishing. You will need to bring half a metre of cotton woven fabric for the cushion. This is an easy project for a beginner. Learn to measure and shape an apron, double hemming on the straight and on curves, designing and adding a patch pocket and ties. You will need a metre of fabric: we have some great nautical linen-look fabrics in stock which are ideal for this, but a mid-weight cotton drill or light canvas is also great. e of apron. As an option, add you own individual style with a different patterned fabric for lining the pocket. A step up from the simple cushion, this project includes an invisible zip but is still suitable for beginners. Once you know how, you can make this cushion in many sizes and colourways to suit every room in the house. You will need to bring half a metre of a woven fabric. This workshop is suited to those with some machine sewing experience. You will create a piped cushion; this will include measuring, cutting, making and attaching bias binding piping, and inserting a concealed zip. You will need a metre of woven fabric (or two contrasting half-metres). This workshop covers how to make a box cushion cover for foam seat pads or backs, for the home, caravan, camper or boat. Although this workshop only covers a simple square or rectangular cushion, we can also teach you more advanced techniques including how to make curved and shaped foam blocks with fitted covers, how to cover the foam for comfort if used as a seat or bed, how to pipe the edges and and how to fit a zip for removal and washing of the cover. In this workshop you will learn all the skills and techniques you need to make your own curtains. You will need some basic sewing skills and some machine sewing experience of straight seams and hems would be helpful. We will be measuring, cutting, adding a lining, adding header tape and hemming with mitred corners as you make your very own sample miniature curtain that you can use as reference for future projects. You'll need to bring a metre each of fabric and cotton lining - or maybe a ready-made curtain from a charity shop that we can cut up! This is a lovely project to make a tote bag to suit your needs - perhaps as a handbag, shopping bag, hobby or craft bag for sewing or knitting, or just to keep things tidy. Make a bag to the depth you want, with a width of 40cm and we will add inner and outer pockets, a lining, a zip closure and fabric handles. As there is such a lot to pack in, it really does take 5 hours, with a short break in the middle to recover from the sewing concentration! You will need to bring one metre of fabric, or half a metre of main fabric and half a metre of lining fabric. Off-white, red or black thread, plus essential materials are provided. Alternative thread colours are available for purchase. This is a fun workshop to make bright seasonal bunting. You will measure, cut and make bunting triangles and attach to 3 metres of binding - all materials are included. Make your own, unique, lined and reversible shopping bag - perhaps to carry work folders, craft work or even some real shopping! You'll need to bring a metre (if 115cm wide) or half a metre (if 140 cm) of fabric for the main bag and half a metre for the lining - we'll help you decide when you book. We have some great fabrics here too, so if you don't bring any it's fine. A lovely little project with cross-hatch quilting, zip and lining. Bring some favourite fabric or choose from our selection. Learn the techniques for applying lettering, motifs and other designs onto fabric. Choose from range of small machine patchwork projects including a multi-use pouch, table or a Cathedral Window pincushion. A two-hour workshop to make a rather lovely multi-purpose reversible bag with a difference. A very secure and stylish way of carrying all those special bits and pieces. Cotton fabric included but feel free to bring your own if you have something you'd like to use - you'll need 2 different fat quarters. Modern sewing machines are great, but the covers they come with (if they come with one at all) sometimes leave a lot to be desired. In this workshop you will design and make your own cover to fit your machine, and it will not only look great but also have useful pockets and the all-important hole in the top for the handle. You'll need to bring a metre of a practical fabric. If you need to take your machine with you on the move, why not make your own stylish and sturdy holdall to carry your machine and its accessories? You can adapt the design to suit your machine and, of course, your finished product will be unique to you. This bag also makes a great and unique piece of weekend luggage. These fun projects are suitable for anyone aged 12 and over, whether beginner sewers or those who just want a little project to make in company. These short workshops include exciting little makes such as mini cushions, draw string bags, bottle bags, pencil cases, ipad & phone covers, fabric flowers, and simple bunting. These are informal days with simple projects, a mix of hand and machine sewing, where you make little things as small gifts or maybe simple Christmas decorations. We've done pin-cushion days as a part for Sew Saturday - great fun with visitors coming for miles around! - and for Christmas, felt decorations and a non-sew folded Scandi star, which were really popular and very social. We supply the materials as a kit and you make it here or take it home to finish. We only charge for the materials as we are not providing tuition, but we do give a helping hand when required. In this two and a half hour workshop you will make an eight-inch drum lampshade from a fabric of your choice, which you can either bring with you or buy from us if you prefer. All other materials are included, and you will go away with a great lampshade that you've made yourself. You'll also take away the skills to make more and we can supply all the components you need for shades of all sizes. We run evening and daytime courses for beginners and improvers. See here for more details. We also run a number of daytime workshops (full or half day) for shorter projects. As with our courses, we limit the dressmaking workshops to three people to make sure you get the support and attention you need. Learn to make a gathered skirt on this one day workshop. You will cover measuring, plain seams and finishing, centred or lapped zip, gathering, traditional waistband and a machine topstitch hem (or hand finished). You will need to bring 1.5 to 2 metres of fabric depending on the length you want and also the fullness of the skirt (more details on booking). Some machine sewing experience is required. In this half day workshop you will make a pair of pyjama pants / casual trousers. It will include measuring, cutting, plain seams and finishing, casing and hems. You will need to bring at least 1.5 metres of woven fabric (more details on booking) and please remember to wash, dry and iron your fabric before the workshop. This is suitable for beginners but you should have some previous experience of machine sewing, maybe through craft projects like the Simple Cushion. These workshops focus on specific technical skills to really give you the experience you need to add that professional finish to your projects (or, in the case of the true novice session, some basic skills to get you started!). These workshops are usually three hours unless otherwise stated. Learn to sew different seams - plain seam, French seam, flat-fell seam, and hairline seam; and use different seam finishes - pinking, zig-zag, machine and hand overcasting, and overlocking. Learn to sew darts (single point and double pointed), pin tucks and twin needle tucks, inverted pleats and box pleats. Learn about different types of buttons and how to attach them, where to place button holes and which type to use. We will cover machine button holes, hand worked buttonholes, a button loop from fabric and a hand sewn button loop. Pick up some useful hints and tips on inserting zips. Part 1 will cover the dress/skirt centred zip, lapped zip and an invisible zip. Part 2 - inserting separating zips and exposed zips. A separating zip comes apart into two pieces and is used for coats, jackets, cardigans etc. Exposed zips have become quite fashionable on garments and are also used on items such as bags. Learn what hems you can use to give you a choice when completing your garment. We will cover a double folded hem, machine top-stitched hem, hand finished hem, machine blind hem, and a rolled hem. Pockets are both functional and decorative, and a stylish pocket makes garments truly individual. We will make and attach a patch pocket with a lining, a trouser pocket and a welt pocket. Have you got a new machine? Had it for a while but never used it? Or just need to remind yourself what it can do? In this workshop we spend a couple of hours going through all the functions of your own machine, trying the different stitches and features to make sure you are familiar with it before you start making. Please bring the instruction book with you - every machine is different! Individual booking to suit you. If you have an older machine that you haven't used recently, pop in with it so we can make sure it's in working order before you start. Do you find commercials patterns confusing? What do all the symbols mean? How do you follow the sewing guide? This is a 'no sew' workshop. Bring along your own commercial pattern and I will take you through the pattern and help you understand how to turn it into the garment you have chosen. A note book might be a good idea too! Do you want to find out more about using an overlocker? Do you have one at home that is still in its box or in a cupboard? Bring it along and we will look at understanding your overlocker, threading and threading (yes, just a few times so you are confident in threading), and how to sew on woven and knitted fabrics. You will need to bring your overlocker and thread. There is no sewing project with this workshop. Come and see what the fuss is all about before you decide to buy an overlocker. In this taster session you will use one of ours to see what they do and find out which model is best for you. Want to work on your own project? No sewing machine? Or not enough space at home? Come and sew in our lovely shop and use one of our Brother sewing machines. A quick demo of the machine will give you the confidence to sew away. Book a seat and machine between 10am and 5pm, Tues to Fri (when available). Please note the £5 hourly rate is for the use of workshop space and facilities only. If you would like assistance or tuition this will chargeable by negotiation, depending on how much assistance you need. Our online calendar is here but do remember that nothing is set in stone and we will always do our best to accommodate times and dates that suit you. And if there's something you want to make that you don't see here, just ask.